"What are murderers like?" "You, me, everyone." 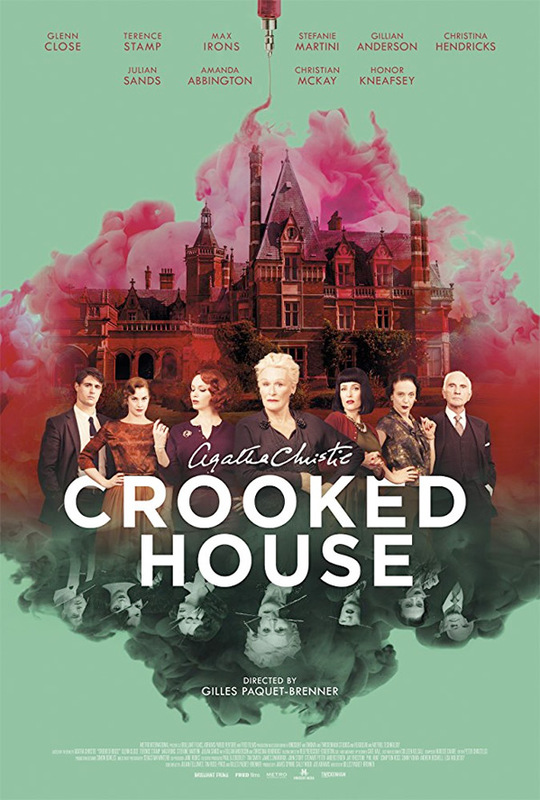 Sony Pictures has unveiled a trailer for Crooked House, adapted from Agatha Christie's 1949 novel of the same name. Max Irons stars as Charles Hayward, spy-turned-private-detective who is invited to help solve a gruesome, mysterious death of a wealthy patriarch. Nobody is above suspicion, including Sophia, his client and former lover. The powerhouse ensemble cast includes Glenn Close, Stefanie Martini, Christina Hendricks, Gillian Anderson, Julian Sands, Christian McKay, Amanda Abbington, and Terence Stamp. This looks like it could be a good double feature with this year's remake of Murder on the Orient Express, especially since they are both Agatha Christie adaptations. There's some strong performances featured here, might be worth a look. Check it out. In Agatha Christie’s most twisted tale, the suspicious circumstances surrounding the death of a wealthy patriarch is investigated by spy-turned-private-detective Charles Hayward (Max Irons), who is lured by his former lover to catch her grandfather’s murderer before Scotland Yard exposes dark family secrets. On the sprawling estate, amidst a poisonous atmosphere of bitterness, resentment and jealousy in a truly crooked house, Hayward encounters three generations of the dynasty, including a theater actress (Gillian Anderson), the old man’s widow 50 years his junior (Christina Hendricks), and the family matriarch Lady Edith de Haviland (Glenn Close). Crooked House is directed by veteran French filmmaker Gilles Paquet-Brenner, of the films Pretty Things, Payoff, UV, Walled In, Sarah's Key, and Dark Places previously. The screenplay is written by Julian Fellowes & Tim Rose Price, based on Agatha Christie's novel first published in 1949. Sony will release Crooked House in select theaters starting December 22nd this fall. Interested?